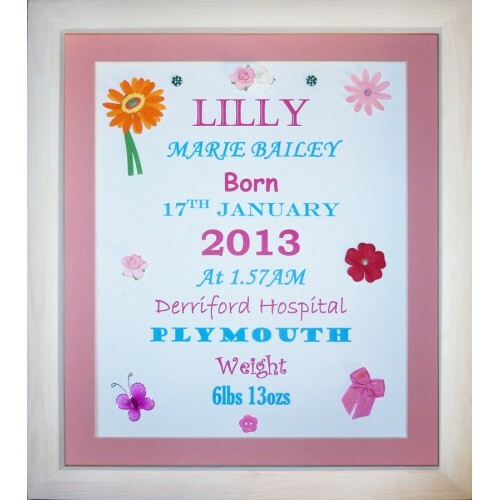 A beautiful Hand decorated, embellished framed name and birth details in blue or pink, this is a chunky, solid wood, white-wash frame, it has a 12”x10” (305mm x 254mm) glass size and it has a quality blue/pink mount to frame your finished, embellished birth name frame keepsake, with the child’s name and birth details written in text and small embellments added to enhance the picture, this makes a really unique baby keepsake, every one is unique and all are made to an extremely high standard, creating a gift you will be proud to give. 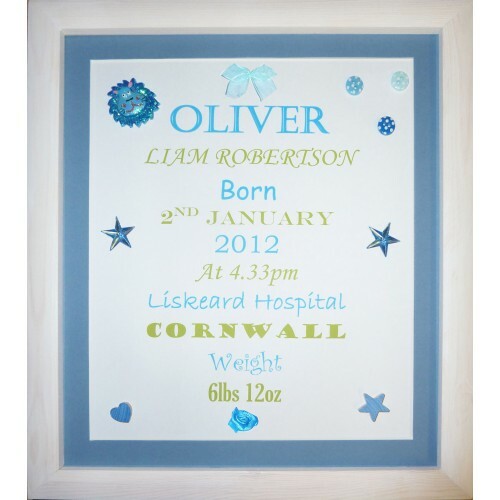 This can make a great keepsake that will be treasured, or for an original new baby gift idea and is a cross between our printed birth details frames and our embellished name frames, this frame is a white-washed 10"x8" (254mm x 204mm) glass fronted frame. 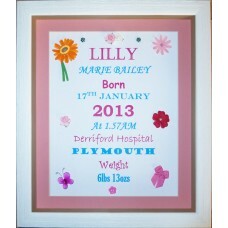 This embellished birth name frame is beautifully embellished with a selection of assorted, luxury 3d embellishments (these will vary from frame to frame but the picture gives you an idea of the things that we will use; buttons, flowers, gems, bows & butterflies, stars, pom-poms, bows, ladybirds, baby feet, tiny trinkets or ribbons may be used), every piece will be slightly different but made to a high standard. 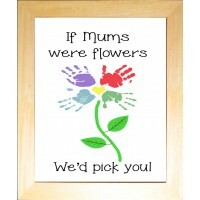 This unique baby keepsake gift is printed on quality, acid-free, archival paper and is printed with quality, acid-free inks for a keepsake that will last a lifetime and not fade away, a really lovely way to capture a moment and truly beautiful. Please allow up to 10 days from placing order for your item to be dispatched, it is presented in a gift box, so perfect as a gift and it will make a lovely addition to any child’s room. This price is inclusive of FREE UK MAINLAND postage, for all other areas we offer a small subsidised posting charge. Please check that you include any capital letters that you want included for the names etc. we will print as you request it, we will copy and paste your text exactly as you instruct us to. 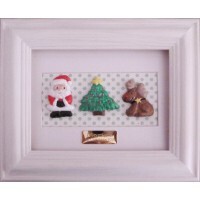 A beautiful hand decorated, 3D clay Christmas character frame, this is a chunky, solid pine, white-w..
A beautiful hand crafted, clay embellished Happy Christmas frame, this is a chunky, solid pine, whit..
A beautiful hand crafted, button people, wedding frame, this is a chunky, solid pine, natural or whi..
A beautiful hand crafted, button people, family frame, this is a chunky, solid pine, white or natura..
A beautiful hand crafted, button people, Grandparents frame, this is a chunky, solid pine, white or ..